I recently attended a blogging conference. Before I went, I searched how to prepare myself for meeting other bloggers and realized I had no business cards to hand out. Wait, that's not true, I had some very very sad business cards to hand out. As in, hand cut, one sided, white printer paper with Times New Roman 12pt font. Sad I tell you, very very sad. Do you have business cards? What do they look like? What is your opinion on handmade business cards? 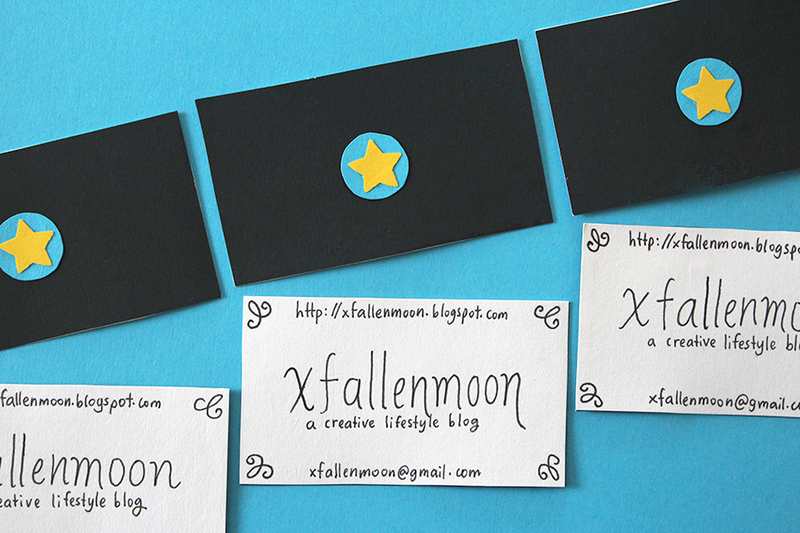 I haven't finalized my branding, so I don't feel ready to invest in professionally printed business cards. Soooo, I figured, why not make my own? That way I can make as many as I need, I'll have some fun, plus, it'll be unique. 1. Cut 2 rectangles of different color (I suggest making one white) and glue them together. Cut out some shapes and make a simple logo. Glue it in the center of the colored side of the card. 2. Write your blog's information in pencil on the white side of the card. When you're satisfied with what you've written and how you've written it, trace it with the black permanent marker (or colored if that's what you're into) then erase the pencil marks.